"My first time out with the F75 was a very pleasant surprise. It was even more user friendly than I could have ever imagined. I choose a spot I had given up on. After briefly reading the manual, learning how to ground balance with the coil pumping procedure, I decided to keep the other settings as close to factory presets as possible. Right off I loved how easy to swing and well balanced the F75 was. All my signals were deep probably because the area had been hunted so hard previously. A few hours into the hunt I had a nice repeatable signal, but very faint. After digging a deep hole in the sandy soil, I hit the clay bottom; putting the coil in the hole I got a less faint signal. Using my shovel, I carefully picked out a chunk of the clay. Opening the clay I saw I was the proud new owner of a cuff Virginia staff button with at least 95% gilt left; this small button was approximately 18'' deep….. wow! A few feet away, out pops a silver 3 cent piece around 10'' deep. I found a few other deep period relics in my short first outing with a brand new detector. All I have to say is that the F75 is truly a work of art!" —Eddie M.
Field Test Report and detector details here. F75+ and F-Pulse and Digger Package = FREE SHIPPING! 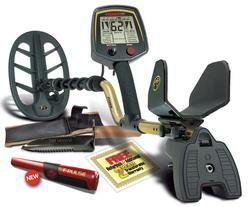 Fisher F75 Multi Purpose Metal Detector = FREE SHIPPING!